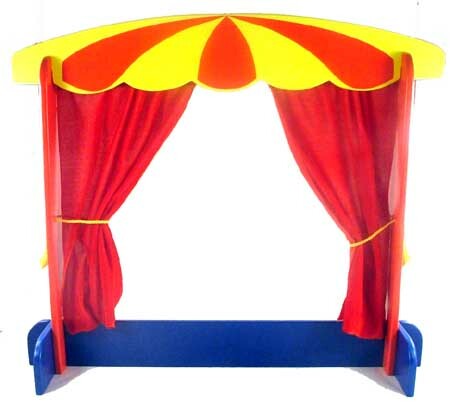 Wooden Puppet Theatre with Red Velvet Curtains. Here is a fantastic, colourful toy for all those theatrical escapades. It comes complete with Red Velvet Curtains which can be drawn aside and held in place with yellow cords. This is a lovely big Puppet Theater which is ideal for glove and finger puppets. In fact there is plenty of space to fit your whole head behind the curtain so if your little one wants to perform they can. Material: Wood, Child-safe paint, Velvet curtain, Cotton Cord . We like this because: "It's a great size and is just begging to house performance after performance"